So why then does Alfa Romeo have two cars sitting at the FCA Heritage HUB, both of which look like unreleased 4C Quadrifoglio prototypes? The FCA Heritage HUB facility is a special collection, which houses rare prototypes and concept cars from Abarth, Lancia, Alfa Romeo, and Fiat. Youtube channel Masterpilot Emiliano Perucca Orpheus was allowed to take a tour of the amazing facility and at around the 10-minute mark, stumbles upon what appears to be two 4C Quadrifoglio prototypes - a white spider and a red coupe. From what we can see in the video, both cars have been modified with carbon fiber front splitters, rear diffuser, and large rear wings (also made of carbon fiber). These clearly look like Quadrifoglio prototypes because they each feature the signature four-leaf clover on the fenders and you'd be right for thinking they may be from some secret, canceled project. As it turns out, these cars aren't as special as the internet has made them out to be. "The 4C vehicles pictured inside the new FCA Heritage HUB are simply an exercise in style done by the Alfa Romeo design team at Centro Stile in Turin, Italy. While they appear to be Quadrifoglio editions, they have the same powertrain as a normal 4C and were only meant to showcase what a possible, more aggressive version of the 4C would look like. 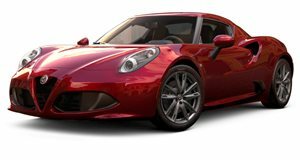 Simply put, they were never meant to enter production as they were only an exercise in design," an Alfa Romeo spokesperson told CarBuzz. We've seen tuners extract almost 500 hp out of it of the 4C's 1.75-liter turbocharged four-cylinder but it appears these cars both have the stock 237 hp figure. A 4C Quadrifoglio remains just a faint dream in the minds of enthusiasts.